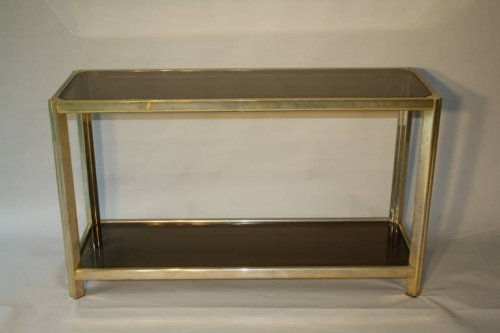 An elegant two tier soft gold metal console with dark smoked brown glass shelves. French c1970. The gold is a light soft colour rather than dark and brassy. Slight natural aging in the metal consistant with age but overall does not detract from the look or value. A great piece for both contemporary and traditional interiors.